While the Vikings are into the playoffs, the Sixers are already out of the race. 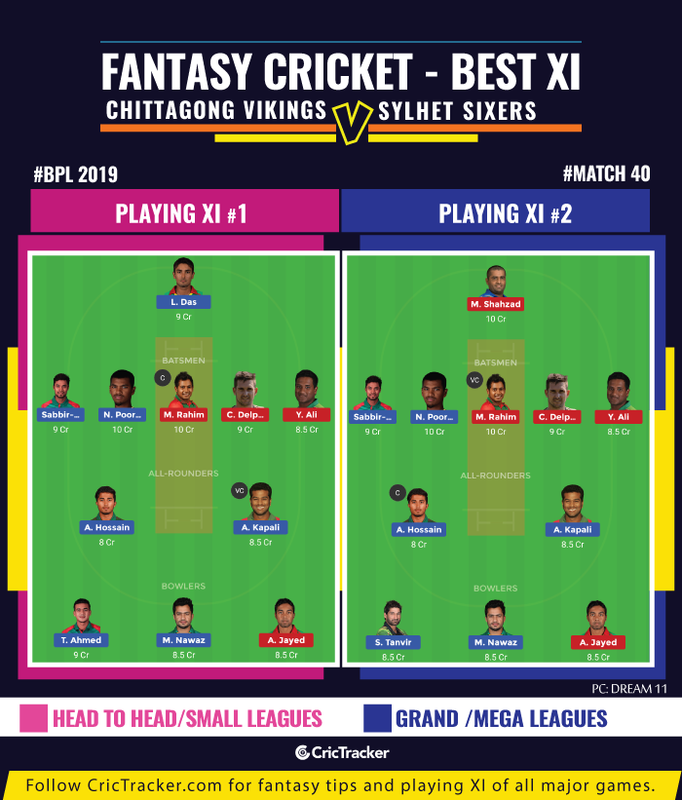 The Chittagong Vikings and the Sylhet Sixers will play their last league game of BPL 2019 on Friday. While the Vikings are into the playoffs, the Sixers are already out of the race. Though, this game is an extremely critical one for the Vikings. They’ll definitely fancy their chances of making it to the top two so that they get an additional life in the playoffs. However, their net-run-rate isn’t great. More than just registering a win, the focus will be to register a victory with a big margin. The team is on a roll at the moment having won both its last two games. The Sixers, on the other hand, only managed to register 4 wins in 11 games. They would be looking for a consolation victory in their final game of this season. The 40th match of the Bangladesh Premier League (BPL) 2019 will be played between Chittagong Vikings and Sylhet Sixers at the Sher-e-Bangla National Stadium in Mirpur, Dhaka. The average first innings score is just 154 at Dhaka in the last three Night games. This shows that the pitch isn’t the best one to bat on during at night. It gets slightly tougher to bat in the second innings. Mohammad Shahzad (WK), Yasir Ali, Mushfiqur Rahim (C), Cameron Delport, Sikandar Raza, Dasun Shanaka, Mosaddek Hossain, Nayeem Hasan, Sunzamul Islam, Abu Jayed, Khaled Ahmed. Bench – Mohammad Ashraful, Luke Ronchi, Nihaduzzaman, Shadman Islam, Robiul Haque, Robbie Frylinck, Najibullah Zadran. Bench – Nasir Hossain, Gulbadin Naib, Wayne Parnell, Mehedi Hasan Rana, Al-Amin Hossain, Mohammad Irfan, Jaker Ali, Patrick Brown, Towhid Hridoy. Sandeep Lamichhane is part of the Nepal team to face UAE. Robbie Frylinck is not yet fit. All-rounder Afif Hossain is opening for the Sixers. His recent scores are 29, 28, 49, 29 and he seems to be in decent touch. He would be looking forward to converting these starts into something bigger in the game against the Vikings. Mushfiqur Rahim, Sabbir Rahman and Liton Das are the three players from who you can pick your captain and vice-captain. The second tier picks can include anyone among Cameron Delport, Nicholas Pooran, and Alok Kapali. Afif Hossain, Mohammad Nawaz are the other alternatives. Amongst the all-rounders, the best picks are Afif Hossain and Alok Kapali. Based on the recent form, you can go for Mosaddek Hossain. You can also take a gamble with Dasun Shanaka and Sikandar Raza, but they will be risky picks. The Chittagong Vikings are predicted to win the match.